On Friday too, the protest had affected the train movement on the Delhi-Mumbai line. New Delhi: Train services were disrupted as the members of the Gujjar community continued to hold reservation movement for the second consecutive day. 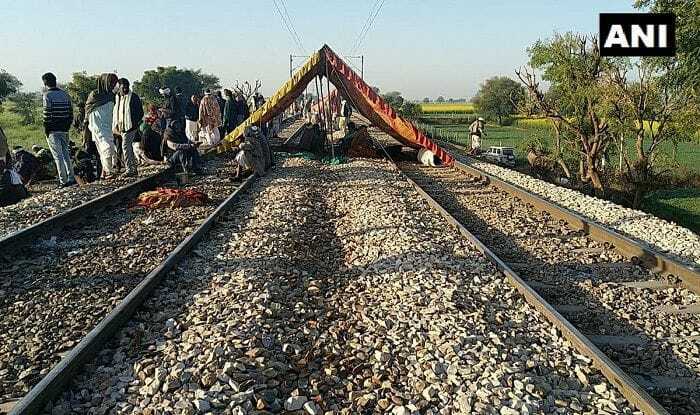 Protesters blocked the railway tracks in Maksudanpura of Sawai Madhopur. At least 4 trains were diverted and 14 cancelled between Sawai Madhopur to Bayana section-Nimoda to Malarna block section in Kota Division of Western Central Railway, news agency ANI reported. Earlier, West Central Railway had released a press release stating that five trains were cancelled and one was diverted. In the press release, train numbers 19020, 12415, 12416, 19021, 12909 were also shared. Passengers travelling on this route are requested to keep checking the updates. Northern Railway CPRO has announced that due to agitation in Kota Division 12059/12060 Kota – Nizamuddin – Kota Janshatabdi Express, 19803 Kota – Katra express trains journey commencing on 09.02.2019 and 19804 Katra – Kota Express train journey commencing on 10.02.2019 have also been cancelled. Rajasthan Staff Selection Board postponed Agricultural Supervisor Direct Recruitment-2018 exam scheduled to be held tomorrow in Jaipur and Kota due to ‘unavoidable circumstances’. Supervisor (Angandwadi worker) recruitment exam scheduled to be held in Ajmer was also postponed. On Friday too, the protest had affected the train movement on the Delhi-Mumbai line. At least seven were diverted and one was cancelled by Railways. In the late development, locals in Karauli district’s Hindaun city protest and block road in support of the ongoing reservation movement by the members of Gujjar community in Sawai Madhopur.